Mission: To monitor, review, and revise the undergraduate medical education curriculum of the University of Virginia School of Medicine to ensure continuous quality improvement toward meeting its Twelve Competencies Required of the Contemporary Physician. Vision: To foster excellence in undergraduate medical education by actively engaging, motivating, and guiding students in the never-ending acquisition of knowledge to help them advance health promotion and disease prevention within society as well as prepare them to deliver technically advanced, patient-centered and compassionate care to future patient populations. 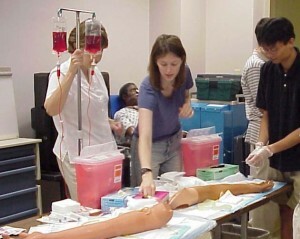 The Curriculum Committee, established and codified in the School of Medicine by-laws, has the authority to set educational objectives, establish educational requirements, establish and approve content, ensure content integration, coordination and coherence, allocate curriculum time, specify teaching methods, select and oversee course and clerkship directors, and evaluate educational outcomes.